Rep. Sonya Williams-Barnes will serve as mistress of ceremonies. Speakers will include Bishop James Black, Pastor of the Faith Tabernacle of Praise Church in Biloxi; Rev. Paul Springer, Pastor of Pentecostals of the Gulf Coast in Biloxi; and Rev. Tony Karnes, Pastor of Michael Memorial Baptist Church in Gulfport. Soloist will be Jeff Harrison. Harrison County Justice Court Judge Dianne Ladner will administer the ceremonial oath. Judge Alfonso took the oath of office Jan. 2 to begin her judicial term. It is traditional to hold a formal investiture at a later date. A reception will follow at Alfonso Realty on Lorraine Road in Gulfport. Judge Alfonso previously served for 12 years as a chancellor – from January 1999 through December 2010. She was the first woman to be elected chancellor in the 8th Chancery District of Hancock, Harrison and Stone counties. She was elected to the Harrison County Court bench and served as a Youth Court judge from January 2011 through December 2018. She was elected again to the Chancery bench in November 2018. Her earlier public service includes Harrison County Family Court prosecuting attorney 1980 – 1983; assistant district attorney for the Second Circuit District of Harrison, Hancock and Stone counties, serving 1984 – 1987; and assistant county prosecutor for Harrison County, 1988 – 1992. She also previously served as an assistant state's attorney for Cook County, Ill.
Judge Alfonso is a founding member of Professionals Advocating for Children Together, PACT, which was organized in 2002 to work on behalf of abused and neglected children. She was instrumental in creating a position of public guardian in 2002 in Harrison County to protect the interests of indigent minors and the elderly. She initiated the first Adoption Day for Harrison County in 2004. She serves on the Mississippi Access to Justice Commission, and she recently completed a two-year term on the Drug Courts Advisory Committee. 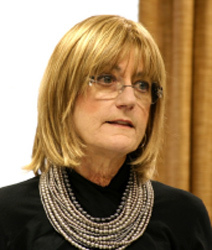 She served on the Media and the Courts Study Committee in 2002, helping shape recommendations for camera coverage rules adopted by the Supreme Court in 2003. She served on the Commission for Study of Domestic Abuse Proceedings, which made recommendations to the Supreme Court and the Legislature in 2008. She received the Mississippi Bar’s Judicial Excellence Award in 2010, and the Public Citizen of the Year Award from the National Association of Social Workers Mississippi Chapter in 2012. She is a Fellow of the Mississippi Bar Foundation. She received the Alonzo Westbrook Public Service Award, John Mason Award from the Gulf Coast Victims' Right Coalition for Advocacy for Victims, and the Award of Excellence presented by the National Association of Legal Professionals. Judge Alfonso graduated from the University of Southern Mississippi with a Bachelor of Arts degree in political science, and she earned her law degree from the University of Mississippi School of Law.